During the initial eight weeks of life, the mother cat's milk is the best kitten food available, but after that, it's time to offer a nutritious formula to your pet. Learn why it's essential to choose a special food formulated for kittens and which nutrients you should expect in a quality food. Why should you feed kitten food to cats who are less than a year old? Perhaps you already have one or more adult cats and are thinking it's more convenient to feed the same adult formula to your new addition. This may be convenient, but in doing so you might be sacrificing your kitten's nutritional needs. Ultimately, kittens have very small stomachs, so they tend to pick a few bites and go, rarely eating a full meal in one sitting. Combine this eating habit with the type of rapid growth kittens experience in that all-important first year of development, and it's easy to see why they need a formula that's packed with optimum nutrition in every bite. Food formulas specifically manufactured for the "kitten" period have taken into account this need for concentrated nutrition. Consumers should expect these specially marked formulas to include balanced levels of nutrients that are safe for sensitive kitten stomachs. Kitten food differs from adult cat food because higher percentages of protein and fat are used in the formula. The following is only a general comparative analysis, and these percentages may vary from one brand to the next. Proteins are necessary for the growth of healthy muscle tissue and cartilage. Getting plenty of protein in its formative years may actually help your cat to avoid painful degenerative conditions later in life. Fats, such as the Omega-3 fatty acid complex, are essential for delivering fat soluble vitamins to your pet. Fats also provide extra energy, something all energetic young kittens need as they pass through this year of rapid growth. Minerals promote the growth of strong bones and teeth. 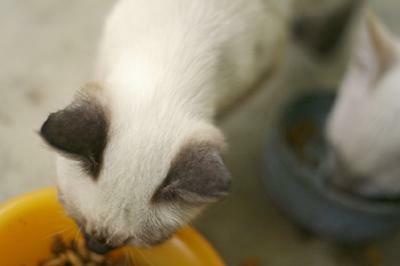 Calcium, phosphorus and potassium are critically important to your kitten's development. For years, conventional feeding wisdom has lead people to believe that a dry food formula was better for cats because it provided some teeth cleaning action during chewing. While this may possibly provide some dental benefits, the fact is that dry cat food is largely made from carbohydrates, an ingredient that can contribute to feline obesity if your cat over indulges, as some cats tend to do. By comparison, a quality wet cat food formula is divided nearly evenly between protein and fat, with the correct percentage of vitamins and minerals in the mix. Since this is much closer to the natural diet cats would receive in the wild, it is digested much more efficiently. Conflicting information still exists regarding whether dry food truly helps to prevent dental disease more than wet food. Dry food is often touted as the means for cleaner teeth. However, ConsciousCat.net reports that most cats do not grind and chew dry food well enough to effectively clean their teeth. Moreover, the carbohydrate residue left behind by dry food may actually contribute to tooth decay. Currently, no conclusive studies have been executed on this topic. So should you feed dry or wet kitten food? It's your choice, but perhaps it's best to have a bit of both worlds, and have dry kitten food available throughout the day, while offering a premium blend wet cat food for the evening meal. If you're still in doubt about which type of food is best for your cat, ask your vet for his or her opinion. Your kitten's nutritional needs are much more demanding than those of an adult cat. Whether it be wet or dry, choose a quality kitten food blend that will help your baby grow into a healthy and strong cat.